"Pharmaceutical Research and Manufacturers of America (PhRMA), are leaning on the United States government to discourage India from allowing the production and sale of affordable generic drugs to treat diseases such as cancer, diabetes, HIV/AIDS and hepatitis. India is currently on the U.S. government's Priority Watch List — countries whose practices on protecting intellectual property Washington believes should be monitored closely. Last year Novartis lost a six-year legal battle after the Indian Supreme court ruled that small changes and improvements to the drug Glivec did not amount to innovation deserving of a patent. Western drugmakers Pfizer, GlaxoSmithKline, Novartis, Roche Holding, Sanofi, and others have a bigger share of the fast-growing drug market in India. But they have been frustrated by a series of decisions on patents and pricing, as part of New Delhi's push to increase access to life-saving treatments in a place where only 15 percent of 1.2 billion people are covered by health insurance. One would certainly understand and probably agree with the need for for cheaper drugs. But don't forget that big pharma, for all its problems still is the number one creator of new drugs. In 2012 alone, the U.S. government and private companies spent a combined $130 billion (PDF) on medical research." And while Slashdot claims that "big pharma, for all its problems still is the number one creator of new drugs," it should be remembered that much of that money comes from federal grants, or in other words, out of the pocket of taxpayers. 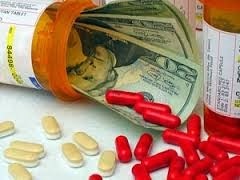 Once these new drugs are developed, big-pharma's business model is defended stalwartly by regulators, the media, and other facets of the corporate-financier oligarchy ruling over the Western world.